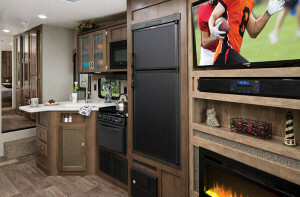 Whether you are a tailgater or you enjoy the general convenience of having everything you need close by, an outdoor kitchen is something you will enjoy. 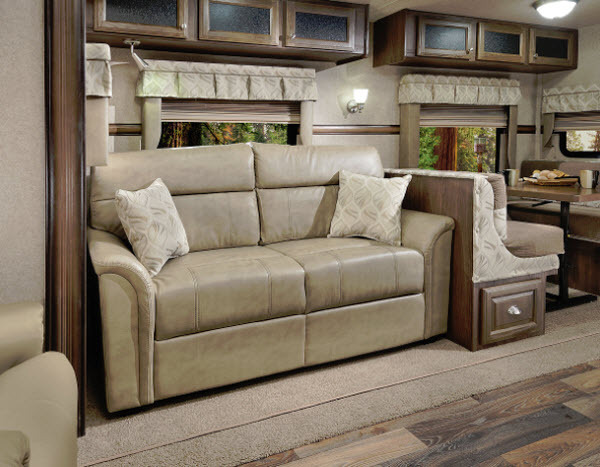 When combined with the luxury of a fifth wheel, things get even better. 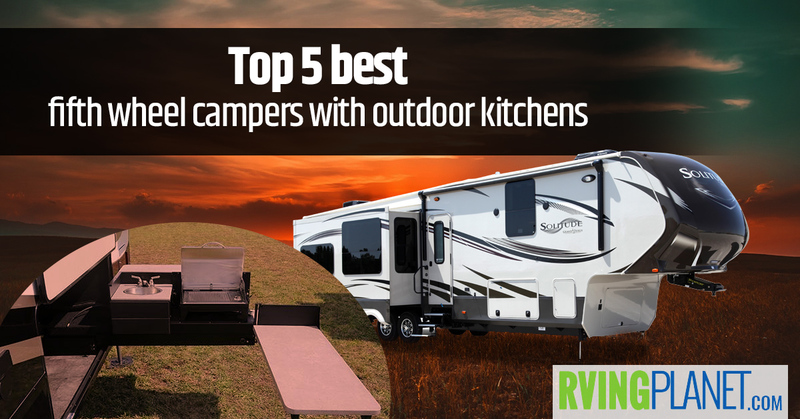 Read on, to discover the top 5 best fifth wheel campers with outdoor kitchens. 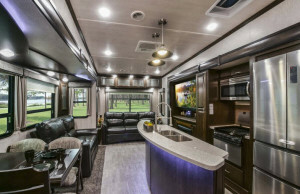 What puts an RV on the list: Apart from having enough floorplans that feature outdoor kitchens, we’ve also found fifth wheel campers with great tailgating features as well, making these useful for someone who wants to spend their time in the great outdoors! 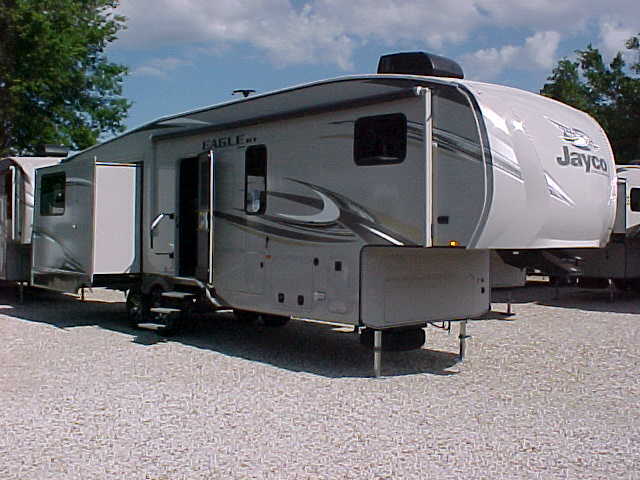 Why we recommend the Jayco Eagle fifth wheel: Similar to its travel trailer variant, the Eagle fifth wheel by Jayco offers varying floorplans with different weight ranges, sizes and sleeping capacities. 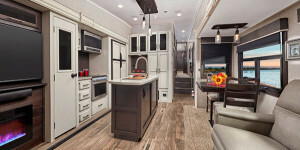 Seven of them feature outdoor kitchens that lie on different ends of the spectrum, from a 36 feet Eagle 317RLOK that sleeps 4 people to the 40 feet long Eagle 347BHOK that has a bunkhouse. Among its long list of features and an equally long list of options, we liked that they specifically paid attention to the towability on this rig by adding a ‘4-star handling package’ that features upgraded MORryde suspension and tyres along with Nev-R-Adjust brakes. On the inside, the 15,000 BTU AC and the LED fireplace were quite impressive. As we mentioned, that long list of features is something we suggest checking out by clicking on the link where you check the floorplans and clicking on the ‘features’ tab! 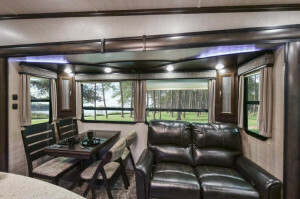 Why we recommend Keystone Hideout fifth wheel: The Keystone Hideout has been featured on our other posts, and for a good reason. 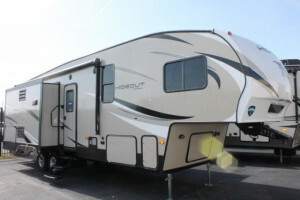 If you’re looking for something lightweight with sleeping room for lots of people, the Hideout is the one to go for. Floorplans like the Hideout and the Hideout are reasons why we recommend it to those looking for fifth wheel campers with outdoor kitchens. 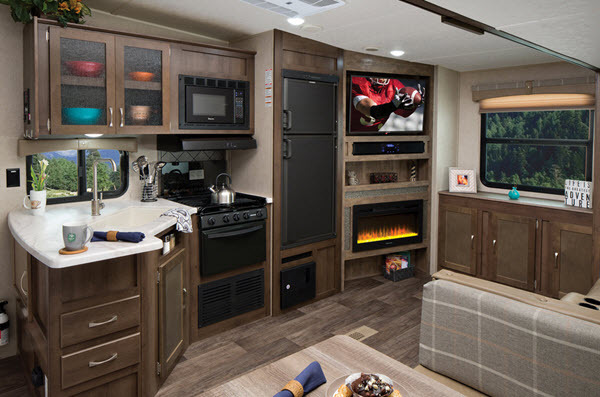 The Hideout features a tri-fold sleeper sofa, a 30,000 BTU furnace, a monitor panel and many other great interior amenities. Head on outside and you’ll notice that the Hideout is built like a tank thanks to its reinforced structure, fiberglass front cap and full-length outriggers! 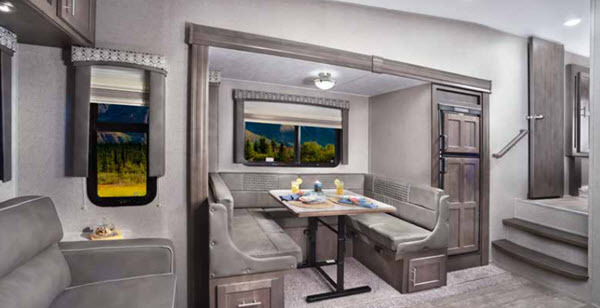 You can add some other features such as a free-standing dinette and a rear ladder on select models too! 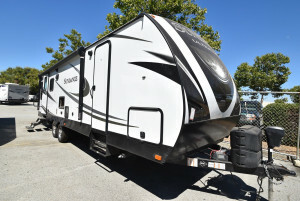 Why we recommend the Heartland Sundance fifth wheel: The names Elkridge and Bighorn usually come to mind when speaking of Heartland. 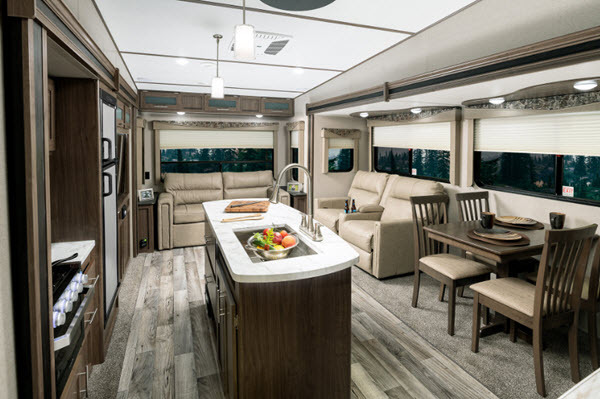 However, we specifically preferred the Sundance because of the number of floorplans with outdoor kitchens that it has (five), and also because they’re lightweight like the Hideout and vary in sleeping capacities and sizes. Check out the Sundance and the Sundance, our personal favorites. 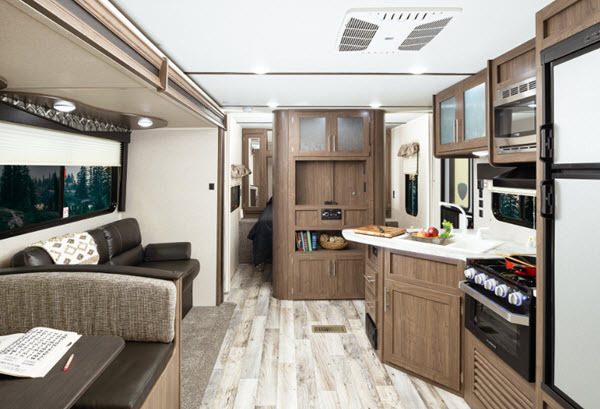 The Sundance strikes a balance between value and performance, and features broadly 2 sets of floorplans: full profile and mid profile. Some of the obvious differences include the price and the difference in features. The full profile has slightly better features, but that doesn’t mean the mid profile doesn’t come in a close second to great amenities! The features that remain the same throughout all of the floorplans include aluminum wheels, universal docking center, solar prep, tri-fold sofa bed, 8 cubic feet stainless steel refrigerator and many others! 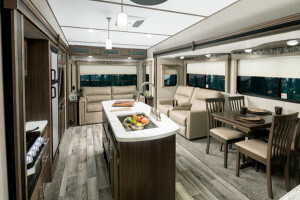 Why we recommend the Palomino Puma fifth wheel: If your choice in fifth wheel campers with outdoor kitchens includes wanting an easy-to-tow, lightweight recreational vehicle, then the Puma does it like one else. 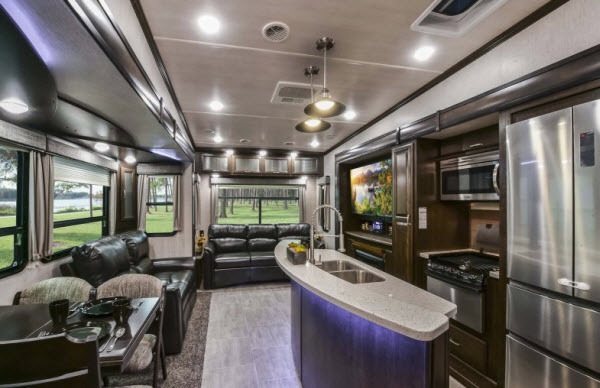 With floorplans such as the Puma and the Puma, it’s even lighter than some of the travel trailers we showcase, and that’s saying something. 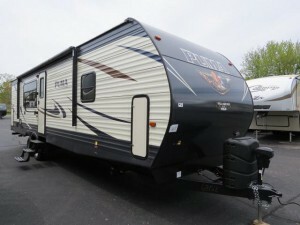 In a nutshell: if you want a lightweight fifth wheel RV with outdoor kitchen, the Puma is the one for you. Akin to the Eagle, the Puma has an extensively long list of features that include 35,000 BTU furnace, built-in knife rack, 3-burner high output range, high density foam mattress and designer window treatments on the inside and tinted safety glass, powder coated frames, clamp ring windows, radius baggage doors and power awning on the outside with a long list of expansions ranging from outside speakers, spare time, roof ladder among many others. If you think that was extensive, you haven’t seen anything! Why we recommend Forest River Flagstaff Classic Super Lite fifth wheel: A good amount of outdoor kitchen floorplans on one RV is fairly hard to find, even in the vast array of travel trailers and fifth wheels in the range of Forest River RVs. 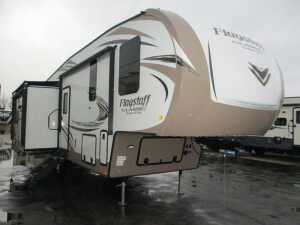 But, their Flagstaff Classic Super Lite has it, keeping it cozy too, with the length averaging between 30 and 35 feet. That, combined with sleeping capacities at mostly 4-5 people, makes it great for couples or a family of 4. 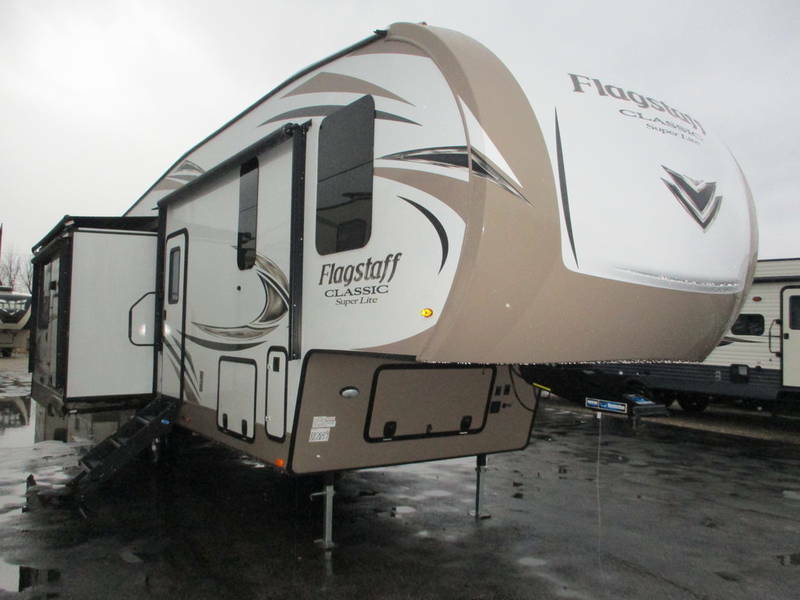 One look at its features and we see that the Flagstaff Classic Super Lite has included some pretty nifty and modern improvements in their rig. 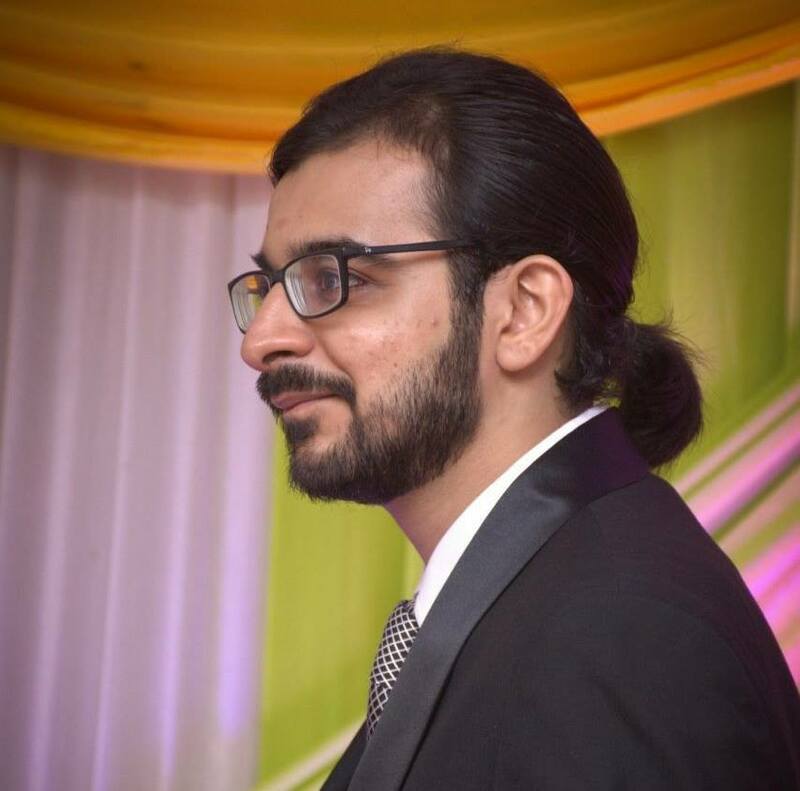 For instance, they have Wi-Fi connectivity that is LTE ready, meaning you could use your phone’s SIM card to convert it into a Wi-Fi hotspot. There are many other features just like these alongside the standard features you’d expect from fifth wheel campers with outdoor kitchens! If you’re looking for a recreational vehicle that’ll let you enjoy the fresh smell of grilled chicken or enjoy a fresh can of cola when camping, look no further than these fifth wheels!